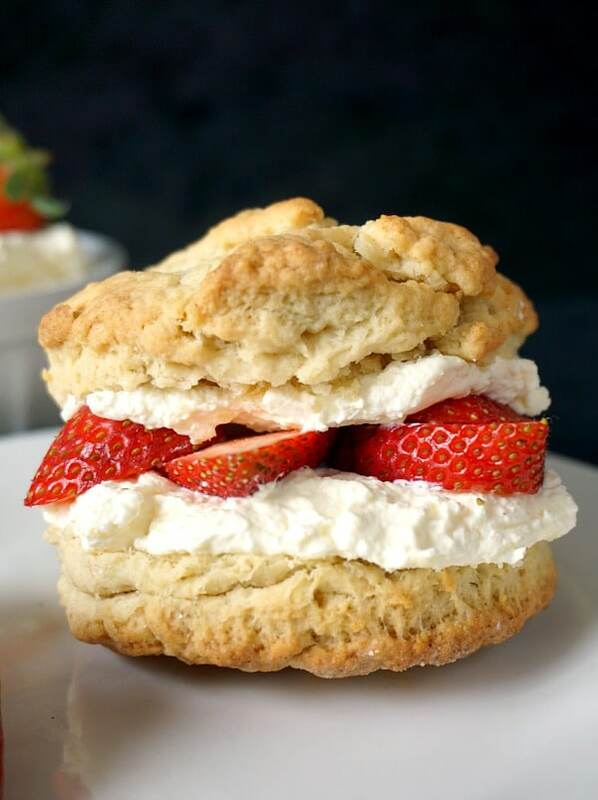 Afternoon tea party strawberry and cream shortcakes recipe, the ultimate summer treat. 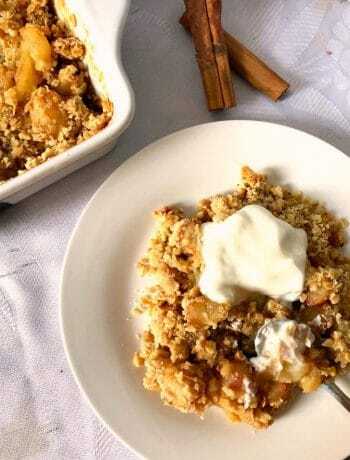 With a golden crumbly texture, silky and luscious cream and fresh juicy strawberries, no other dessert goes so well with a nice cup of tea. What a treat this is! The Afternoon tea is so quintessentially British. Dating back to the early 1800s, the afternoon tea has become a ritual, and although in past it was a luxury that only the wealthy could afford, perhaps nowadays it’s more of a matter of lack of time rather than money when it comes to having an afternoon tea. It usually consists of nicely-cut sandwiches, scones and cakes, and of course, tea. Posh hotels will have a wider selection of black and green teas, otherwise the good old black tea is the favourite. It wasn’t until a few years ago that l had a fine afternoon tea in London and that was an unforgettable experience. It can be pretty expensive mind, so why not do it at home? Any luscious cake or mini cake would do. The more indulgent, the better! Thinking about it, my Chocolate roulade would be another great treat for tea time. Just make a nice pot of tea and invite friends over, and your party will be a smashing success! You can’t think of a traditional British summer without strawberries and cream. And watching Wimbledon, of course. Obscene amounts of strawberries and cream are served up during the Wimbledon, and rightly so, it is the simplest and most delicious dessert. I wasn’t a big fan of tennis until l met my husband, l was actually completely oblivious to what was going on in the tennis world. Even now, l would just watch the final with him, since he absolutely loves it. I think l still like the dessert more tough. These gorgeous shortcakes are super easy to make, and can be enjoyed throughout the year, since now we can find strawberries pretty much any month. But then, since strawberries are at their best now, we better take advantage and enjoy them before the season is gone. One tip when you halve the shortcakes, they should really be cooled down, otherwise they might crumble. And before they go in the oven, it is best to be kept in the fridge for at least half an hour to firm up. And that’s it! Perhaps you can throw an afternoon party for Mother’s Day? 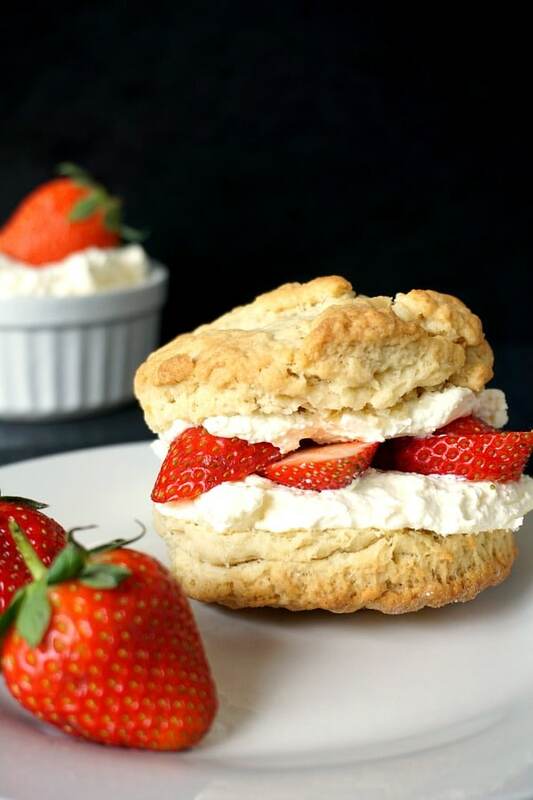 If you’ve liked my SHORTCAKES RECIPE WITH STRAWBERRIES AND CREAM or any other recipe on the blog then don’t forget to rate the recipe and let me know how you got on in the comments below, I love hearing from you! You can also FOLLOW ME on FACEBOOK, and PINTEREST to see more delicious food and what I’m getting up to. 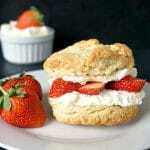 Afternoon tea party strawberry and cream shortcakes recipe, the ultimate summer treat. 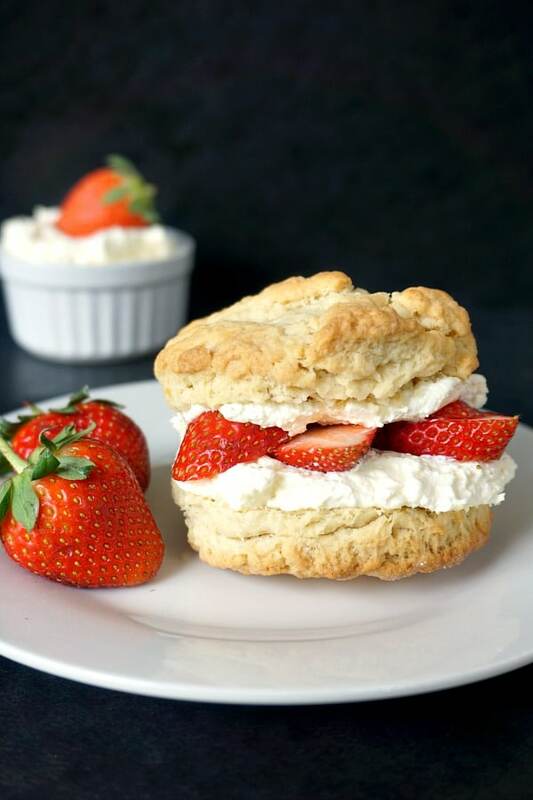 With a crumbly texture, silky and luscious cream and fresh juicy strawberries, no other dessert goes so well with a nice cup of tea. Preheat the oven to 200 degrees Celsius / 400 degrees Fahrenheit. In a pan, add half of the double cream and butter and mix gently until the butter melts. Remove from the heat and let it cool down, then add the vanilla extract. In a bowl, add the flour, baking powder, sugar, milk and the cream mixture and mix everything well to form a dough. It it sticks to your hands, add more flour. Roll the dough to a 1 1/2 cm thickness, then use a cookie cutter to cut out 8 biscuits. Place on a baking tray that had been lined with baking paper and chill in the fridge for half an hour. Bake for 15 minutes until golden, then remove from the oven and let the shortcakes cool down. Use a sharp knife to halve the shortcakes, then beat the remaining cream until it forms stiff peaks. Spoon the cream onto half on the shortcakes, then add slices of strawberries and top wth the other half of the shortcakes. This is my mom’s all time favorite dessert ever! She loves the biscuits with the strawberries and cream. Looks so good! !